Summit Power Limited approved 30 percent cash dividend to its shareholders for the 18 months period ending on 30 June 2017. 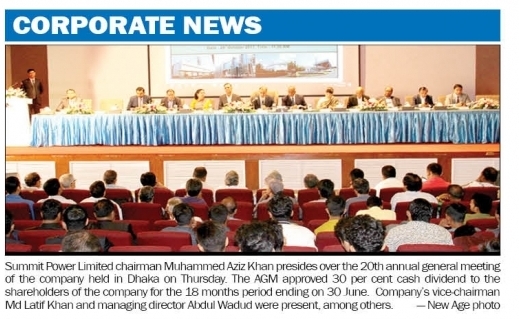 The dividend was approved in presence of the Company’s shareholder at its 20th Annual General Meeting (AGM) held at Krishibid Institution Complex, Farmgate, Dhaka. Summit Power Limited has been consistent in giving out dividend since its enlistment in the Dhaka and Chittagong Stock Exchanges. Presided over by Chairman of Summit Power Limited Muhammed Aziz Khan, the meeting was attended by Vice Chairman Md. Latif Khan, Managing Director Lt Gen (Retd) Engr. Abdul Wadud, and other Directors, Anjuman Aziz Khan, Jafer Ummeed Khan, Ayesha Aziz Khan, Helal Uddin Ahmed, Syed Fazlul Haque (FCA), Faisal Karim Khan, Mustafizur Rahman Khan, Faruq Ahmed Siddiqi, Azeeza Aziz Khan, Arif Al Islam and Company Secretary Swapon Kumar Pal (ACA) and other senior officials. A large number of shareholders also attended in the meeting. Summit Power Limited (SPL) is the leading private power producer of Bangladesh and a publicly listed company in Dhaka and Chittagong Stock Exchanges. Presently Summit Group is supplying 1,490 MW electricity to the National Power Grid. In addition, Summit Power Limited is constructing two new power plants in Kodda, Gazipur with capacity of generating 449 MW electricity which are expected to come into operation by early 2018. Power generation concerns of Summit Group has been receiving the best power plant awards from government of Bangladesh since 2013. Summit Power Limited more recently received AAA long term credit rating from CRISL.